It's easier for me to "blog" on our Facebook page--visit us there to see what we've been doing! The gorgeous weather lured us outside for a picnic--and an early Memorial Day celebration. Some of our relatives are laid to rest in a beautiful little country cemetery not far from where we make our home. Though it is in the middle of acres and acres of freshly plowed farm field, the cemetery itself is a lush green rectangle surrounded by mature evergreens, oaks, and maples. After we found great-grandma and great-grandpa's site, we meandered around to look at what other bits of history this peaceful place offered. We also listened to bird calls and made our guesses as to which bird it might be. We took note of the new oak trees that were only about 1 foot tall. We watched beetles crawl across our picnic blanket. We were thankful for our lives and for the people who have helped us become who we are today. 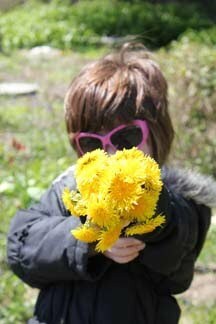 Our youngest kid and Andy Warhol have one thing in common: A love for wigs! We made this one from paper plates and torn pieces of paper. This wig only took us about 10 minutes to make (and obviously looks more like a hat). If you have more time, try this more elaborate wig. coloring pages of his art and anything the kids want to add. Here is an Andy Warhol Soup Can coloring page that is fun to color in outrageous colors. Lives of the Artists by Kathleen Krull has short bios with good humor. 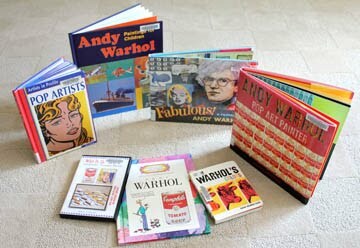 Andy Warhol by Mike Venenzia is good; but the kids like the video even better. We love the series Who is the Artist? with Kay Alexander. I always enjoy getting a stack of books in a wide variety of reading levels--including this picture book that's "below" their reading level. I found the more we read about his art and the more we see his work, the more familiar they become with each piece. It's common to hear, "Hey! we just saw that!" and proceed to flip though the pile of books to find the matching picture. similar to Andy Warhol's prints of famous people. According to the National Wildlife Federation, "when we let our kids play in dirt we're not only allowing them to explore the wonders around them, we are also exposing them to healthy bacteria, parasites, and viruses that will inevitably create a much stronger immune system!" Well...that's not a problem around here! 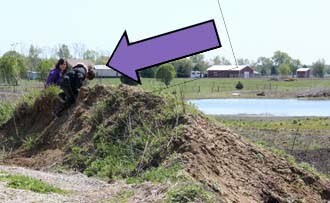 When visiting Grandma's house they head straight for the dirt/clay mound--and that's good news for the whole family. "Studies have shown that simply having contact with dirt, whether it's through gardening, digging holes, or making pies out of mud, can significantly improve a child's mood and reduce their anxiety and stress." In other words--I have some very happy kids! An early Spring was a treat. 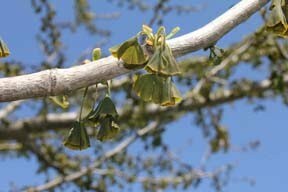 However, frost hurt the leaves on the gingko tree. The kids always get more excited about learning when there is a craft added. Currently, the girls are attending a homeschool class through the county that focuses on habitats. During each class, they travel to various forest preserves in our area as the local naturalist leads them on hikes and explains the wildlife/insects/foliage of our area. The girls are eager to share their new knowledge when the arrive home--and always have more questions. So lately botany has been the focus around our home. Lucky for me it's a great theme for Spring! 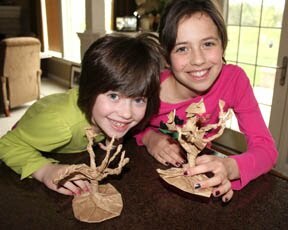 On Pinterest I found these cute trees made out of paper lunch bags--perfect! Here are directions for the tree craft. Both days we talked about woody plants and their characteristics. I also had them color their own nomenclature cards. We'll continue to reference these as we continue our botany discussion throughout the month. I Ate A Rainbow Today! All this hoopla about government regulations concerning public school lunch programs has us thankful we have the freedom to devour delicious, nutritious, fresh meals everyday without stressing about the whole matter. When snack time & lunch time roll around (which is when we happen to be hungry) we open the fridge, select some fruit, and feast on a rainbow of colors. We check the fridge every night before supper and discuss how each person can incorporate any of their missing colors. It's usually as easy as eating half a banana or dishing out a small cup of applesauce. We have found that Blue/Purples are the hardest for use to check off everyday. We've learned to stock the fridge with purple grapes, blueberries, and even the no-sugar added blueberry applesauce cups. We've also convinced one of our kids to add raisins to her morning oatmeal or on lettuce salad. Find what works best for your family. Here is the chart I designed, laminated, and glued a large flat magnet to the back. It hangs on our fridge so each family member can mark off their color as they eat it. We use a Wet erase marker--NOT a dry erase. Dry erase kept accidentally getting smudged off by other users; wet erase (found at the local office supply store) stays on all day without problem. There are many other links. Use your favorite search engine to find "Eat a Rainbow"--you'll find lots more. We have Spring Fever and are ready to be outside! We made these "Birds Seen in Illinois" cards last year and have them out again! We use them as reference as we head outside for our first Spring Nature Hikes! Granted, we won't see a lot of these birds, yet. However, the kids love shuffling through & looking at the images. We laminate ours and use them as reference flash cards. If used as Montessori nomenclature cards, we don't cut off the "answer bottoms" until the kids are comfortable with the names of each bird. Also, if you are going to cut off the "answer bottoms" right away, I suggest you sticker code them so the kids can self check their answers. For example, place a green-circle-sticker on the back of Robin and place a green-circle-sticker on the back of the Robin's name. Then, stick a yellow star on the back of the Red Winged Black Bird and a yellow star on the back of its name. Continue doing this until each picture and each name has its own set of matching stickers. When the kids match the bird picture to the bird name, they can self-check by flipping over the cards and see if the stickers match. Go to our PDF Supplements Page to download a copy for yourself. Please take note: These are FREE and are intended for homeschool use. 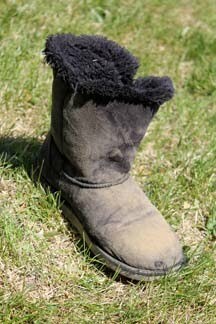 They should never be sold. Our oldest student made her own ABC presentation: She narrates this video that showcases her animal alphabet art. Our ABC book "unit study" was better than I could have imagined. There are hundreds of ABC books that are geared toward a higher reading level. We found the easy-to-follow layouts and the laid back writing style made these books a playground of knowledge. Everything from wild animals and intricate farm operations, sign language and super heroes, to Norman Rockwell and even physics! The plethora of topics made our heads spin while we happily sat on the couch together for another author's interpretation of our simple 26 letters. On a side note: Our oldest student is a voracious reader who enjoys material way above her "grade level". This ABC study was a joyous way to show her that you can't judge a book by it's cover. She is now more likely to peruse a variety of books before making an opinion. We are eager for sunshine and warm weather. Our cabin fever results in playing with our food. It turns out that Strawberry-Banana caterpillars are delicious! I wonder what kind of moth it would have been?